30X handheld magnifying glass with 12 pcs LED lights and 1 pcs UV light, easy use, would help someone with low vision see clearer, ideal for examining fine prints in reading newspapers, maps, stamps, coins, electronic parts, plants, jewelry, needlework and more. Just require added two AA batteries then you can work with the lighted magnifier, you can see objects clearly in dark or insufficient light conditions. The UV light works as a counterfeit detector. This magnifying glass with light equipped double real glass lenses make the surface durable and scratch resistant. This LED lights handheld magnifying glass is the best gift to kids, grandparents and elderly. Please note that this product is powered by 2 AA batteries but we do not provide batteries.  This handheld magnifying glass with light equipped double real glass lenses make the surface durable and scratch resistant.  The 3.38 inch diameter lens 30X magnifying glass optical clarity with maximum view, great for viewing and scrutinizing a wide area of text or tiny details.  Equipped with 12 energy-efficient LED lights and UV light, ideal for night reading assistance in low-light conditions, the lights provide an evenly lit viewing area, that can last for 50,000 hours without degradation of Its brightness. The UV light works as a counterfeit detector for things such as money, credit cards, passports and more. If it doesn't meet your expectations, just contact us, we will try our best to find a satisfactory solution for you within 24 hours. 100% MONEY BACK GUARANTEE ensures this will quickly become your favorite no-risk purchase. 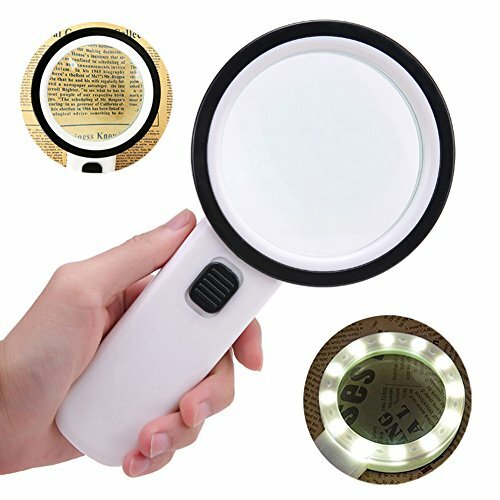 ☑️30X HIGH POWER MAGNIFICATION : This handheld magnifying glass provide 30X magnification effect, equipped double glass lenses, would help someone with low vision see clearer, use this magnifier for reading maps, see the tiniest details, or magnifying virtually any text to make it more visible and easier to read. ☑️HIGHT QUALITY & MULTIPLE USE : This magnifying glass with light equipped double real glass lenses make the surface durable and scratch resistant. 30X clear magnification, ideal for examining fine prints in reading newspapers, maps, stamps, coins, electronic parts, plants, jewelry, photos, needlework, crafts and more. ☑️GREAT KID & ELDERLY GIFT : This magnifier is a best gift for kids, grandparents and elderly. Clear 30x magnifying lens great for seniors, excellent for small print on coupons, prescription and leisurely reading, children explore nature. Compact and stylish design, portable weight with gift box. ☑️100% MONEY BACK GUARANTEE: If it doesn't meet your expectations, just contact us, we can exchange or offer a full refund to you. We devote ourselves to provide the best customer service and bring the best shopping experience to every customer. ☑️BRIGHT LED & UV LIGHT : This handheld magnifier with 12 pcs LED lights and 1 pcs UV light, easy use, just require added two AA batteries then you can work with the lighted magnifier glass. The bright led lights can illuminating what is being looked at, you can see objects clearly in dark or insufficient light conditions, especially help people with macular degeneration see better. The UV light works as a counterfeit detector for things such as money, credit cards, passports and more. If you have any questions about this product by EREMC, contact us by completing and submitting the form below. If you are looking for a specif part number, please include it with your message.